AMD EPYC has been leading the way with its push to show that single processor servers are now a viable alternative. It has an entire “P” series of processors designed to take advantage of this trend. We covered this in AMD EPYC’s Extraordinarily Aggressive Single Socket Mainstream Pricing back in 2017. When Intel briefed the press and sent STH as well as other outlets its SKU list it left a series of processors out. 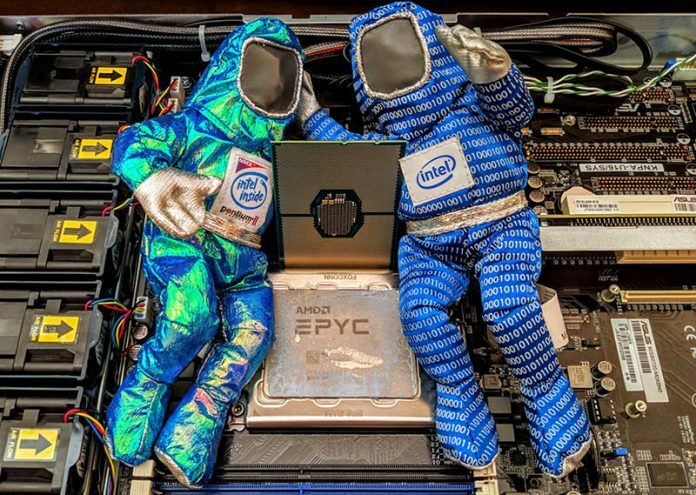 Intel is feeling the pressure from AMD EPYC competition and is launching a series of “U” processors that do not have UPI links and are therefore single socket only parts. The Intel Xeon Gold 6212U will be a counterpart to the Intel Xeon Platinum 8260 with a 2.4GHz base clock speed and a 3.9GHz turbo clock. Without the UPI links, the Intel Xeon Gold 6212U will still share a 165W TDP. At $2000 for the Intel Xeon Gold 6212U, this is an enormous discount over the Intel Xeon Platinum 8260 at a $4702 list price. As a comparison, the AMD EPYC 7551P is a 32 core part at around $2200 street price and a 2GHz base to 3GHz clock speed. Intel seems to be positioning these two chips against one another offering higher speed cores and a slightly lower price point. At $1500, the Intel Xeon Gold 6210U seems to be based around the Intel Xeon Gold 6248, at just under half the cost. Both are 20 core, 40 thread CPUs with a 2.5GHz base and 3.9GHz turbo clock with 150W TDP. We do not have exact pricing for this, but we have been told that they should hit in the $1000-$1100 range. Intel Xeon Gold 6209U CPUs mirror the feature set of the Intel Xeon Gold 6230 CPUs with a 2.1GHz base and 3.9GHz turbo clock. Like the Intel Xeon Gold 6230, the Intel Xeon Gold 6209U also features a 125W TDP. The AMD EPYC 7401P is a 24 core part also with a 2GHz base and 3GHz turbo range, and a higher TDP. This comes in at around $1050 street, although we have been buying them for the STH lab at much lower prices. Just to put this in some perspective, here are the dual socket numbers we already published in our launch piece. 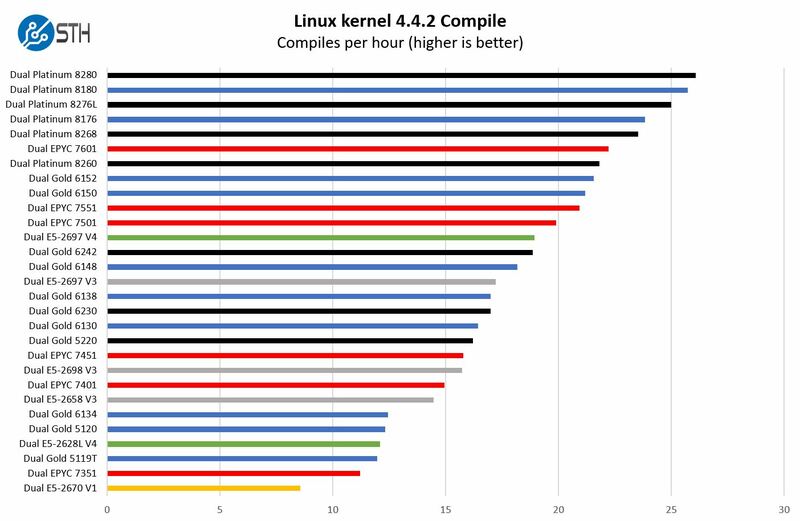 The Linux Kernel Compile benchmark we use scales well from 1P to 2P in this range. Using the Intel Xeon Platinum 8260 to AMD EPYC 7551 numbers as well as the Intel Xeon Gold 6230 to AMD EPYC 7401 figures, Intel is going to offer leading performance at both ends of the spectrum with its U parts over the AMD “P”-series. John on the STH team has single socket numbers coming next week that will confirm this. AMD still holds a clear benefit. Its single socket CPUs have more than twice the PCIe connectivity of a single Intel Xeon Gold U series CPU. For form factors like popular 1U 10x NVMe (plus NICs) or 2U 24x NVMe (plus NIC), the AMD EPYC solution still has a clear benefit. At the same time, Intel did not publicly push this information to the press during its April 2, 2019 launch event in San Francisco. It did not pre-brief the press on this line of AMD-competitive Xeon U series SKUs. Our sense is that these chips may be designed for OEMs like HPE and Dell EMC to use when a customer is pricing “P” series AMD parts against Intel Xeon. We covered what Intel had to do using the Intel Xeon Gold 6100 series in Intel is Serving Major Xeon Discounts to Combat AMD EPYC. This seems to be a direct competitive response to lower the number of “Meet Comps” that Intel and its partners have been going through. This is what competition looks like, finally. This would kill Xeon W — or is this already dead Xeon line? The naming of these processors is confusing. How does a single processor Gold 6230 get renamed Gold 6209U? It would make more sense to call it 6230U. The same goes for the other SKUs. I guess somebody in marketing decided that these needed to be positioned below the non-U chips. There’s also no direct match to 7351P for core-based software licensing. Maybe the higher-clocked parts are a better match there?? Isn’t intel 2nd gen Xeon SP supposed to compete with EPYC ROME. 32core AMD still beats this. Eventually 2nd gen Xeon Scalable will have to compete with 2nd gen EPYC, but for now only first gen EPYC is in the market. We were purchasing Dell servers early last year. I would have loved to get some 6415 or 7415s with EPYC CPUs, but Dell didn’t release them until much later, so we were forced to get dual processor Intel systems. Intel earned our sale purely based on timing and availability. I doubt we were alone. It will be interesting to see how competitive these are when Zen 2 launches! 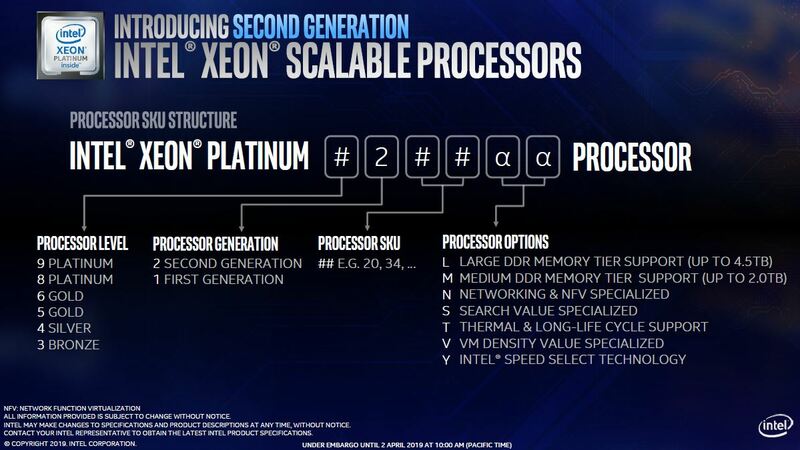 @KarelG Yes…been looking at this board and if i can get one of these “U” series xeon chips, it seals the deal. Thank you AMD Epyc for better competition than ARM, IBM and all those other has beens!! I will definitely buy one of those. People have to remember that Current generation AMD CPUs are really more like a four socket system on a single chip.